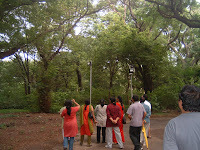 It is not the easiest of things to do on a Sunday morning – getting up early to set off on a tree walk in the Government Museum campus. But this is Madras Week and somehow a few of us find that extra ounce of energy. Prasad, a local resident, is the first to arrive. Usha from Nizhal greets us at the entrance to the Museum complex. Prasad is an early morning walker and the Museum compound is where he usually comes to. But Prasad is upset, upset that the Museum authorities having now stopped morning walkers like him from entering the compound after bomb scares all over the country. He hopes that they will admit people like him who have for years used the pathways inside the premises to take the early morning breath of fresh air. Pushpa, botanical curator at the Museum, arrives at about 7am. She too has had an early start, having left her home in Avadi more than an hour earlier. Madras Narasimhan Pushpa is what she tells me when I ask her full name. She is a fund of knowledge – you can probably ask her anything you want to know about flora and chances are you will get an answer. 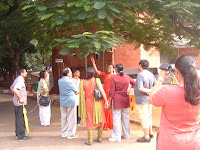 It is her passion for the subject that surfaces as she leads our group of ten from one tree to another. The Government Museum premises in Egmore, spread over 16 acres, has the largest variety of plants and trees in Chennai, she says. 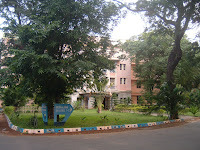 Women’s Christian College has the second largest, in its campus of 20 acres. I have never before been to the rear side of the Museum. As we trudge slowly beneath the tree canopy, it almost seems as if we are walking into a forest. 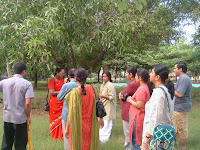 A large colony of bats greets us with shrieks and flutter of wings as Pushpa stops by to explain a thing here and something there. They are obviously not used to human sounds early morning. Prasad confirms that the early morning walkers usually receive no such greeting from the bats. So it must be our chatter. 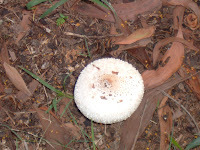 Pictures show tree cover in front of the Connemara Library inside the campus; Pushpa getting started; a white mushroom; Pushpa continuing her lessons; and the walkers taken aback by the shrieks of bats at the rear. A good finish to a week of Madras week activities. Great reports.